There is a new Superman in town and his name is Lex Luthor. Lex's coming out party comes in the form of taking care of four gunman holding hostages at Geneticron. Upstate Clark and Lois are busy moving into their new home. They have a heart-to-heart with their son Jonathan about not taking the easy way out even if he does have super powers. Clark catches a newscast about Lex and the hostage situation and decides the time has come to resume the mantle of Superman. As a mysterious man watches from an undisclosed location Lex is explaining his mission to the reporters that have gathered in wake of the hostage situation but is interrupted by Superman. Superman tells Lex that he knows who and what Lex is and to take off the shield and the cape and hand them over. Lex refuses and when Superman reaches out to take the symbol off himself he is shocked by the defenses in Lex's suit. This leads to a fight between the two with each man accusing the other of showing their true colors. Meanwhile three men associated with the group that had taken hostages at Geneticron are having trouble with their cargo, which was stolen when the authorities cut power to the building. As Lex buries Superman under rubble Clark Kent steps forwards which confuses everyone. Above them the coffin that the men were stealing bursts open and their escape vehicle explodes. The coffin's occupant crashes to the ground. Superman tells Lex that he is through playing nice but Lex tells him to hold that thought as something walks through the remains of the flying vehicle. Superman is shocked to see that that something... is Doomsday. Story - 5: I honestly don't know where to begin with this review. Seriously. I loved this issue so much and there are so many things about it that I liked that I just don't know where to start. 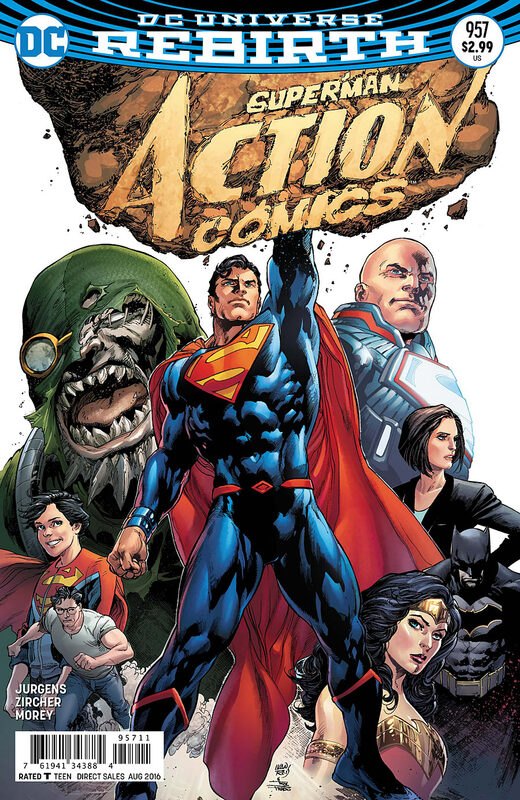 From the opening scene with Maggie Sawyer and Jimmy Olsen to the introduction of Lex Luthor to Clark shaving off the beard and putting on the new costume to his confrontation with Lex to Mystery Clark and Doomsday showing up towards the end of the issue...it was just about everything I could have asked for. It's weird too because for years I was of the opinion that simply bringing back a past creator that had a successful run on the various Superman books would not guarantee a return to greatness. This is by no means meant to be disrespectful to those creators but in comics, like other areas of life, you can't go home again. I've also been of the opinion that as much as I love my era of Superman (1987-2006) I didn't want DC to simply bring back that version of the character and pretend that none of the New 52 happened. Every generation deserves their own Superman. Oddly enough DC has managed to both bring back a past creator and a past version of Superman and have it not only make sense but be a really good read as well. This wasn't a surprise. Dan Jurgens is one of the few creators that has worked consistently for three decades and rolled with the times. He still has his own style, both in terms of writing and art, but his work feels contemporary. So even though Maggie Sawyer is back and Jimmy is one of the supporting characters and Lois and Clark are married this doesn't read like a Superman story from 1996. Things have changed. Clark has a kid now. He's older than the New 52 Superman and more experienced. He's also been dropped into a world that's not his own and even though he's lived there about five years he's done most of his work from the shadows. This goes to the heart of why bringing him back works. They aren't simply rolling back the clock. There is a lot of dramatic potential in this new era and Jurgens started his end of that off in fine style. My favorite part of this first chapter was the confrontation between Superman and Lex. One of my biggest problems with the New 52 Superman is that he wasn't confident enough. It seemed that most of the writers thought the best way to approach the character was to have him doubt himself until the dramatic moment when he finally realizes what he has to do and then launches himself into the fray. While that works for a Superman that is just starting out having this happen to a Superman that's been on the job for five years makes the character look weak. This Clark saw Lex on the television wearing his shield and the cape of his counterpart and that was it. One quick shave and a change of clothes later he was on the scene to let Lex know that this will not stand. It was also where the new dynamic started playing out. The New 52 Superman is dead. Pre-Flashpoint Superman has decided to resume the role full on but nobody knows who he is. Superman is pretty sure that this Lex is up to no good and will soon be making trouble in the neighborhood but after FOREVER EVIL Lex has been a hero and a member of the Justice League. We know that Lex is eventually going to go bad again and we know that this Superman is a hero but the public doesn't, so their fight looks like someone impersonating a dead hero attacking a man that is trying to step into that dead hero's shoes. Superman has to prove himself again, which is interesting and exciting on a dramatic level. I just hope he doesn't have to die to be accepted by the public because lately that seems to be the only way the people of the movie or comic book world will embrace Superman as a hero. Jurgens did a masterful job of setting up the mysteries of Mr. Oz watching from afar, a new Clark Kent just showing up on the scene and the return of Doomsday. There was enough meat on the bone to make me satisfied with this issue in and of itself but also made me excited to come back for more to find out what's going on. Seeing Maggie Sawyer back in Metropolis was great and I hope that this isn't another case of a classic supporting character returning to the book and then getting quickly forgotten or pushed to the side. So we're off to a great start. The Pre-Flashpoint Superman is back in a somewhat classic looking Superman outfit, there's a conflict with Lex Luthor, there's a mystery with Clark Kent and Doomsday is back. I don't know how long this new status quo is going to stick around but I am going to enjoy for as long as it lasts. Art - 5: Patrick Zircher has a very clean and illustrative style, which I have always felt works best for Superman. His work in this issue was amazing and I loved that he never took the easy way out on the backgrounds. Lex's armor had a lot of detail to it as well and while it is a bit off putting for Lex to be wearing the Superman shield (which is kind of the point) I like the design of his new duds. The new Superman outfit is okay. I know this wasn't Zircher's design but he does a great job of making the S shield pop out whenever it's on panel. The action scenes were great and that last page reveal of Doomsday was everything you could want in a cliffhanger. The only quibble I had with the art is the color of Superman's boots but that's not Zircher's fault so I won't harp on it. Cover Art - 4: I prefer this cover to the one they originally solicited. This has a first issue/start of a new era feeling to it. The fact that Batman and Wonder Woman are on it is a bit puzzling. I assumed it had something to do with the fact that Lex, Doomsday, Superman, Batman and Wonder Woman had all appeared in a big budget movie recently but maybe this is a hint at things to come. 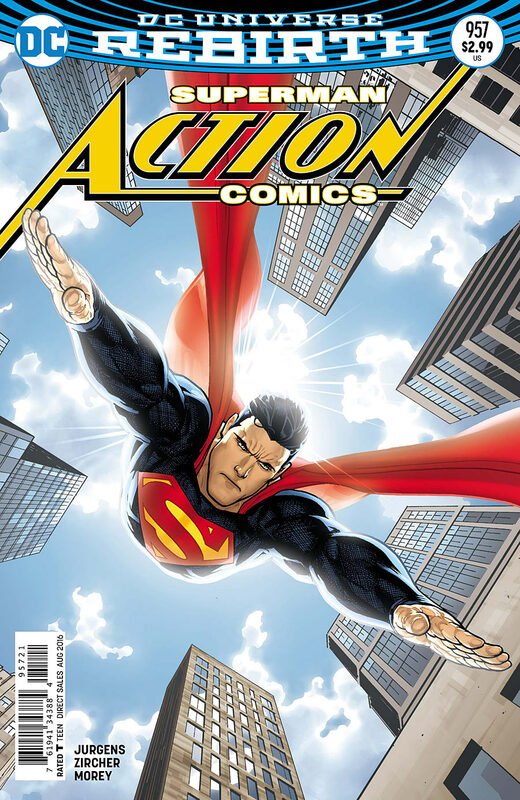 Superman looks great ad I like how they worked ACTION COMICS into the cover organically. Variant Cover Art - 5: I almost wish they had gone with this for the main cover. It has such a dynamic layout and screams, "He's back!" It has been a long time since a cover hit me this hard as an iconic image of Superman, who looks like he is all business and here to help.